Visit the AION Shop from 3/4 to 11/4 and give the Wheel of Destiny a hefty spin to win some great prizes! For the first time, the Wheel of Destiny has two wheels spinning at once: on the first wheel, which is our standard wheel, you can collect 6 keys which will take you to the second wheel. The price for the second wheel may be a little more expensive at 75 AION Coins, but it holds even more valuable items for you! You have up to 5 minutes to try your fortune on the second wheel until you are returned to the first one. 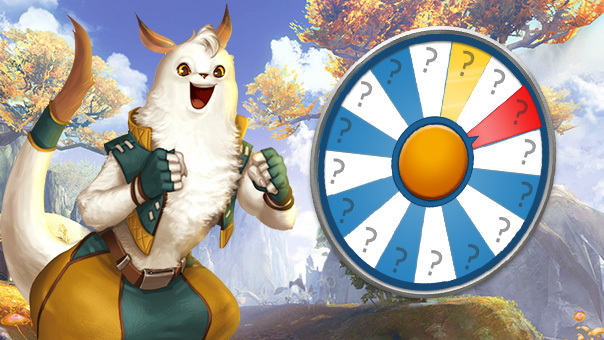 With a little luck, on the first wheel you can win some valuable items such as the Tabby Bunny Hat - Protective Shield (30 days), the Box containing Transformation Contracts of Eternity (7 days) and the Rabbit Cape. The second wheel has the chance at some extremely rare items such as the [Rune] Ultimate PvE Enchantment Stone, the [Rune] Ultimate PvP Enchantment Stone or the [Rune] Legendary Transformation Contract (10 types)! So what are you waiting for? Simply click on the Wheel of Destiny in the AION Shop to get a spin. After purchase, the wheel kicks into motion and stops on a random segment, which displays your prize.